In the summers of 2009 and 2011, the student ministry at Dauphin Way UMC served with Service Over Self (SOS) in Memphis, TN. The work involved repairing damaged and leaky roofs in a neighborhood similar in demographics to the South Broad Street area in Mobile. Teams returned from these experiences realizing that Mobile had a need for this type ministry and asked, "why are we not doing something....?" The vision for Raise the Roof Project grew from that question. The South Broad Street neighborhoods have historical significance to Mobile, but are now known more for crime and urban poverty. Organizations such as the Inner City Mission and Taylor Park Community Center seek to restore hope to the neighborhoods through community programming, after school tutoring, and a women's homeless shelter. These are addressing important needs, but the sub-standard living conditions of families in the area are a stark reality. Mobile is among the top cities in the country for rainfall amount and has an annual threat of hurricanes. A dry home is a safe haven for families. Acts 1:8 challenges the Christian to be a witness of Jesus Christ in Jerusalem (in your local city), in Judea (in your state or region), in Samaria (among the lost and forgotten), and to the ends of the world (internationally). For the local community and for those from longer distances, this ministry will provide an avenue to fulfill God's desire for His church. The hole in the roof is the avenue for the friends and the paralyzed man to get to Jesus. The paralyzed man needs healing and forgiveness, the friends need to provide support and compassion, and everyone there that day is filled with awe at seeing God's grace for the paralyzed man. In some cases, the homeowner will be the paralyzed soul. For others, the mission team may need the healing. Either way, the roof is the entry point into the hearts and lives of those who need to experience the grace, healing, and love of Jesus. 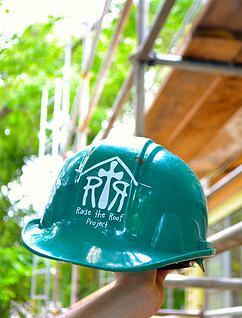 On June 24, 2012, Raise the Roof Project began our first summer with two weeks of work. Teams replaced three roofs on homes near South Broad Street during the day and spent their evenings in worship and fellowship at Dauphin Way. The ministry continues to grow each year. Thirty-one roofs have been repaired and more than 625 students have served with us. God has called us to participate in His great purpose of drawing people into relationship with Him. Our hope is that through making themselves available, each volunteer who serves, each contributor who donates, each neighbor who wonders why teenagers are on top of a house, and each homeowner will be drawn into a closer relationship with Jesus Christ.